This is a perfect cake for this time of year. As August draws to a close, the markets start to flood with apples. Apple cakes have a tendency to be dense, saturated with butter or caramel, too heavy for the weather. Not this cake. This cake is light as a feather. 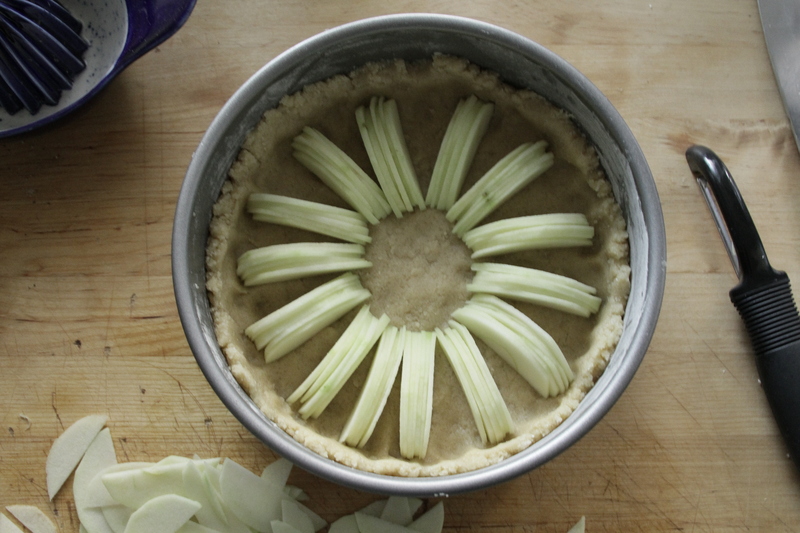 You make a very basic tart-like dough in the food processor. It gets pressed into a springform pan but not tightly. Press it too tightly and you will have a nice crispy exterior with very little cake within it. 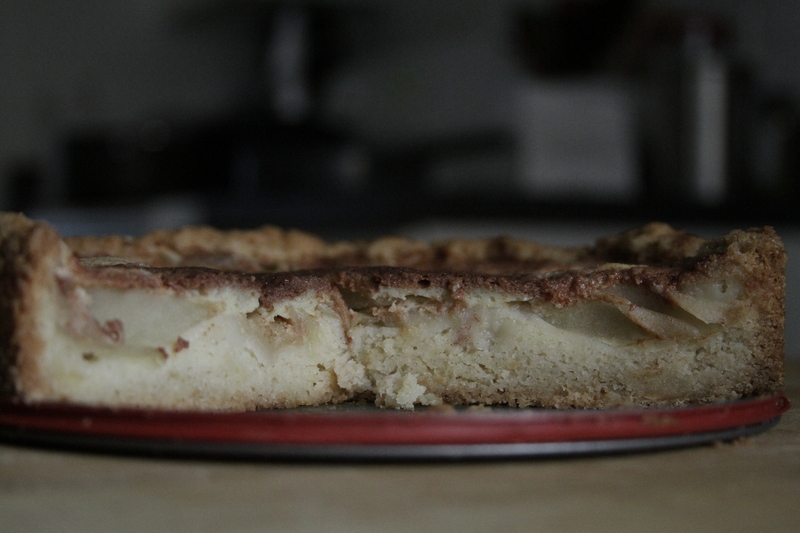 Pressed lightly and the outside develops a nice crust while the inside has a nice thin layer of fluffy cake. Then the apples. The apples are where the work comes in to this cake. First, the apples are peeled, halved, cored and sliced as thin as you can get them. Then they are set standing atop the dough in a circular pattern. I tend to vary my patterns a little bit, but on this occasion I started by gathering five or six apple slices and setting them at regular intervals around the pan. I then started adding more sliced apples to fill in the gaps. Once all the gaps were filled, I took the remaining slices and cut those in half to more easily squeeze every last one into the pan. You want to fill every nook and cranny. The majority of the baking is done with just the dough and apples. This allows the dough to seal before any liquid is added and it allows the apples to retain their structure. After 45 minutes of baking, the cake is taken out and a simple butter, sugar, cinnamon and egg mixture is spooned over the top. It cooks for another 20 minutes until the topping is just set. It takes a while to cool and it greatly benefits from being made a day in advance so the flavors can all settle. The end result is just lovely. Every element separate and distinct but all in harmony. It takes a little bit of work to make it happen, but it is totally worth it. Preheat oven to 350°. Butter and flour an 8-inch springform pan. In a small bowl, beat the egg and add the vanilla to it. Set aside. 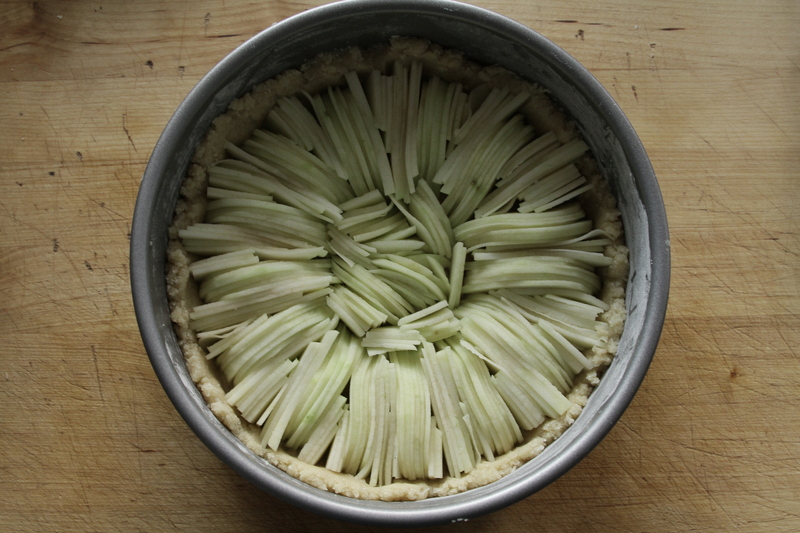 Now arrange the apples in a circular pattern atop the dough. Squeeze in as many as will fit and then squeeze in a few more until you literally cannot fit another apple slice in there. Slide the pan into the oven and bake for 45 minutes. Remove the cake from the oven and spoon the topping evenly over the cake. Put the cake back in the oven for 20 to 25 minutes until the topping is set. Remove the cake and set to cool on a rack for 20 minutes. Then run a knife along the edge and remove the sides of the springform pan. Let the cake finish cooling. The cake is best the next day so once it is cool, cover tightly and store at room temperature until the following day. Then serve with some vanilla ice cream. * If you want to make the topping right after the cake goes in, you can go ahead and melt the butter and add the sugar and cinnamon but wait until the last minute to add the egg. Sugar will change the structure of the egg if it is left to sit. I would recommend sitting the melted butter-sugar-cinnamon mixture on top of the warm oven while the cake bakes to keep it fluid. Then mix in the egg at the last minute.